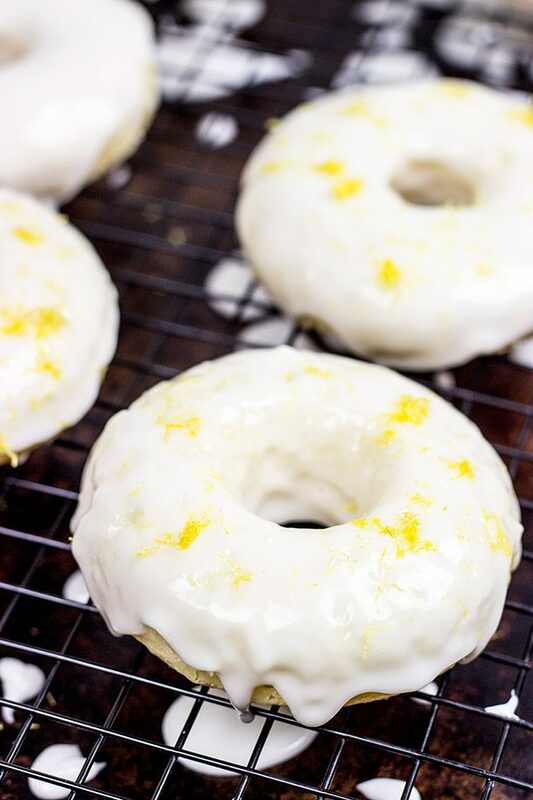 These Baked Lemon Doughnuts are packed with lemony deliciousness! Now that the weather is thinking about getting warm again, I’ve been craving lemon-flavored everything. Lemon seltzer water. Lemon chicken. Lemonade. If it involves a yellow, football-shaped fruit, then I’m all about it lately. 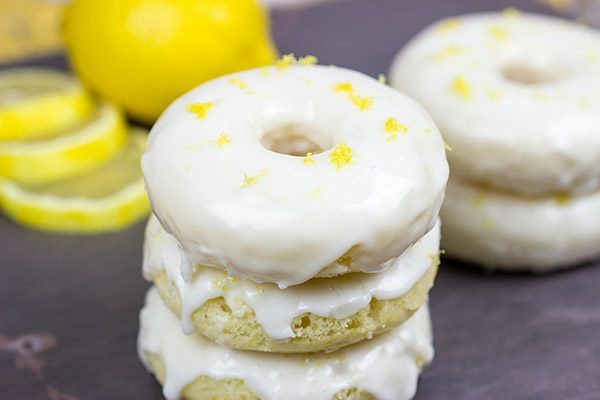 So I decided to make something sweet for dessert with lemon…and that’s where these Baked Lemon Doughnuts come in. 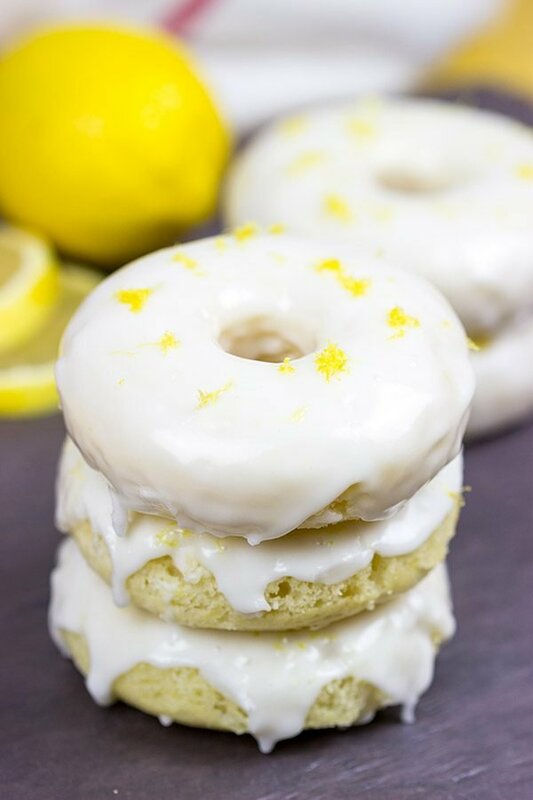 Light, cakey doughnuts topped with lemon glaze and a pinch of lemon zest. I told you that I’m loving lemons lately! The return of spring also means the return of baseball. Now I’m not a huge baseball fan. I’ve said that before, and I still hold to it. Baseball is just too boring for me to watch on tv. Plus, the pros only play 5,219 games a season…so remind me why I should care if they win or lose a single game? I used to be a huge baseball fan when I was a kid. I collected baseball cards. I knew all of the rosters. But then I transitioned over to football and college basketball, and I never looked back. I did come across a really interesting job the other day, though. Mud collectors for baseballs. According to official major league baseball rules, baseballs must be “properly rubbed so the gloss is removed.” Rubbed with what, you ask? Well, mud, of course. And not just any mud. A special mud. A mud that is harvested by skimming the top layer off of riverbanks along the Delaware River. There is only one company that is officially licensed to sell this mud, and every team (major and minor league) uses this mud. Talk about a monopoly! But I’m ok with this guy having his monopoly. He skims hundreds of pounds of mud and then strains and cures (i.e. lets it sit) in his backyard for months. I know there are some odd jobs out there (*ahem* food blogger *ahem*), but this one takes the cake. Err, maybe the pie. A Mocha Mississippi Mud Pie, perhaps? At what point in the year do you crave lemon? Have you ever harvested mud? In a large bowl, add the flour, baking powder, sugar and salt; stir until well combined. Dice the butter into ¼” cubes. Using a pastry cutter or two table knives, cut the butter into the flour mixture. Using a piping bag or spoon, fill each doughnut cup ¾ full. Bake at 350°F for 9-11 minutes, or until doughnuts are light golden brown and springy to the touch. Let cool before removing from the pan. Whisk powdered sugar, milk and lemon juice together in a medium bowl. 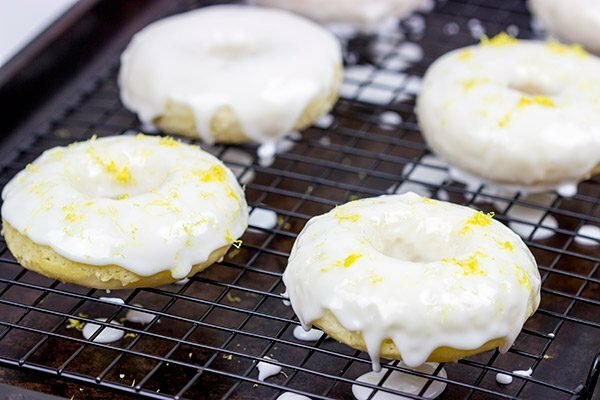 Once doughnuts have cooled, pour glaze on top and let sit until glaze has hardened. Garnish tops of doughnuts with lemon zest before serving. Speaking of Lil Shashi, she has been on a major lemon kick recently – yesterday she put lemon in her cream cheese so she could make lemony cream cheese cucumber sandwiches – but her eyes might pop out of her head if these made an appearance in front of her! Deeelicious way to start off a Monday. my friend! I know, right, Shashi? What a strange job! I also love how there is only one guy who is authorized to collect the right mud for baseballs. (He still doesn’t make very much money if I recall correctly…) And this food blogging thing isn’t going South for you, Shashi…it’s going North! As in, bring those treats you make up North to me. 🙂 And Lil Shashi with the lemon cream cheese cucumber sandwiches? She’s a little foodie in the making! What have you created down there? Haha! Thanks so much, Johlene! I mean I like lemon throughout the year…but this time of the year when it’s just starting to get warm? Lemon everything!! Why thank you so much, Smitha! You can just stare at these doughnuts all day. 🙂 Seriously, though, they aren’t very hard to make. And you could use a muffin tin if you don’t have a doughnut pan…you’ll just have to bake them a bit longer. Give it a shot! The only way to get better is practice!! Mud collectors for baseballs? That’s interesting! All kinds of jobs out there, isn’t there? I crave lemon dessert all year round. A few years back I tried a lemon tart from a local place and was hooked ever since. Absolutely love it and I ALWAYS have lemons for lemon water (and may for making a dessert, lol). These donuts look delicious, David. I could eat like 1 or 5, lol!! Pinning 🙂 Have a great week! Tell me about it, Dawn! I was so surprised about the mud collector thing. What an odd job! And I’m with ya on the lemon desserts. I do love a good chocolate dessert…oh, and cinnamon anything…but lemon is right up there at the top, too. Hope you have an awesome week yourself! Hi David! My doughnut pans are coming out! I always have lemons on hand as so many recipes call for juice or zest. Lemon juice can be frozen in ice trays and stored in a zip bag, the same as you do with broth. Bottled lemon juice should be banned! What a fun job playing with mud – I used to “bake” mud pies on the back porch when I was little, not too tasty but fun! These donuts look so fresh and delicious! I actually adore lemon desserts, can never have enough! There is no time of year I don’t crave lemon, these are calling my name — loudly! I always crave lemon. I wouldn’t admit to it without plausible deniability, but I like it better than chocolate. So if these donuts amount to little cakes that I can scarf down for breakfast, uh, hells to the yeah. I’m holding you to that statement. Next time I make some sort of crazy chocolate dessert, you aren’t getting any. Because you like lemon better. But that means I have to share my lemon doughnuts with you, huh? I know what you mean, I have been craving lemon, but then I love lemon anytime of the year. Your doughnuts look so delicious. I wish I had a doughnut pan, maybe it’s time to get one. I would love one for breakfast or right now! I want to be a mud collector. Okay, maybe not. But dude…This is so random but I really want lemon chicken now. Obviously, these doughnuts (donuts?!) will be for dessert! PS- Niki saw your pesto pasta recipe and has demanded it for dinner! 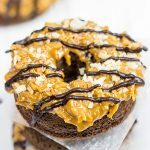 Your blog really is the place to come for delicious donut recipes, David. I am all about the lemon flavours at the moment, especially when it comes to dessert. I think that is a sign that Spring is nearly here. Mud harvesting??? Hmmmm….I will need to think on that one! I have harvested lemons 🙂 I do need to get myself a a doughnut pan. 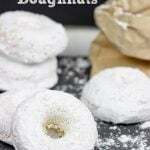 I love these baked doughnuts! Haha! You definitely should get into mud harvesting, Kathy. That would be a new addition to your farm! 🙂 And yes, go get a doughnut pan ASAP. 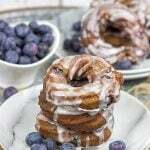 They aren’t too expensive at all…and then you can bake all sorts of doughnuts at home! THAT GLAZEEEEEEE! Oh man, you perfected it! I love having lemon anytime. This doughnut looks gorgeous. I love the glaze. Wish I could grab one right now 🙂 YUMMY! OMG. Those look delicious! 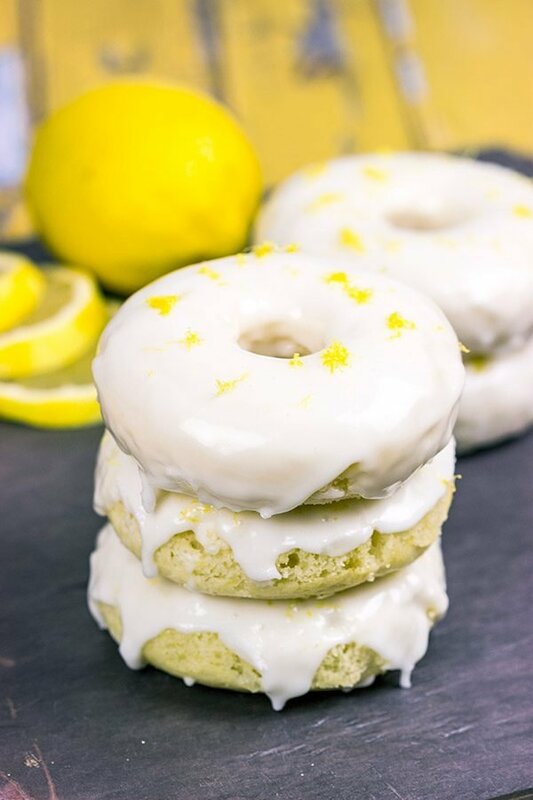 I was looking for a new doughnut recipe and I’m a lemon lover. Thanks for sharing. I am NOT a good baker but these look easy enough.